Daily tours offer the maximum amount of freedom and choice in any Turkish bike tour. We frequently operate centre based tours from our base in Goreme, Cappadocia- an incredibly scenic area which is fast becoming a hub for all kinds of biking experiences! A made-to-measure full day guided road or mountain biking tour costs 180 Euros per person (1 pax), 120 Euros per person (2 pax), 100 Euros per person (3 pax), 90 Euros per person (4+ pax). Prices include a very good restaurant lunch and good quality bike and helmet hire. Private or open groups are available- please email us for details. Take a rest day to go sightseeing or walking and don’t pay for the biking tour! Goreme’s singletrack MTB trails are becoming increasingly popular and offer world class trail biking. There are at least three days worth of world class trails within riding distance of Goreme, and if you decide to repeat your favourite routes more than once then a fully loaded week of singletrack riding becomes a real possibility. The trails really are addictive, you will not be disappointed! For the less adventurous there are also plenty of easy dirt road biking options- often linking up some of the region’s most must see sights! Click here to see our most popular Goreme Singletrack Daily Tours Itineraries. Cappadocia is a perfect region to cycle tour, with a well developed network of traffic free roads, sandy dirt tracks, smooth and easy footpaths and an almost endless list of sights and experiences. We have quality bikes for hire in our Goreme office, and know some excellent routes too (guided and self-guided options available). We also have road bikes and a selection of challenging asphalt tours- contact us for details. 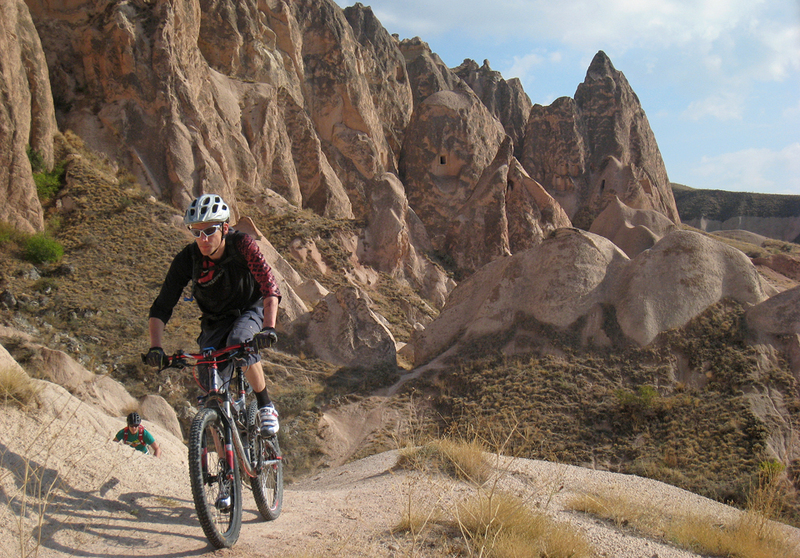 Click here to see our non-technical MTB Goreme Cycle Touring Itineraries. Goreme is a small village in central Cappadocia- an area known for it’s magical lunar landscapes, “fairy chimney” rock towers, dormant volcanoes and lush, hidden gardens. Enter Cappacocia and you enter a new world- one that time has left behind. But at the same time you’ll find one of the best balances between tourism facilities and unspoilt charm. You’ll also find yourselves in one of Turkey’s best cycling destinations. Our office is very easy to find- directly opposite Butterfly Balloons on the road that goes up towards Pigeon Valley. Whether you plan to take a day or two to poodle around Goreme’s glorious valleys on two wheels or you’re looking for a week long journey of discovery we can help! We’ll suggest routes, free of charge to let you explore the area at your own speed. Or we can help with logistics like taking your luggage onto the next hotel. Or we can organise your entire trip! Goreme has been our home for the last 15 years and we know the area like the backs of our hands! Just contact us for advice and ideas! I would be in Nevsehir in July and I would like to do a Have day Bike tour on Sunday 10 2016. Hi could you please send me ore information on the mtb tours. I’m very much interested in the singletracks and don’t mind doing them alone but would need to rent a bike. I will be in turkey from 1 may. I’m interested in daily tours and bike hire. Please can you let me know about prices too. The Rand is very weak right now. Do you speak spanish . My english is very poor.? Hola. No hablamos español. Pero escribimos para nosotros en español y vamos a tratar de entender! Morning! My husband and I will be spending 4 days in Goreme at the end of April and are very interested renting road bikes while we’re there. Can you please send me more information about costs, the types of road bikes available and suggestions for areas to explore. Many thanks!!! My wife and I will be in Cappadocia from late April 12th (should be arriving by bus) to the morning of April 16th (leaving Kayseri for Istanbul). We are interested in mountain biking some or all of our visit. What are your daily rental rates? We would probably go self guided. We are 63 and 64 (opps), but experienced mountain bikers (single track and some downhill) in pretty good shape (ah, except for my ski injured titanium knee). Your photos along with everything we have heard of your area look wonderful. We might enjoy some single track play as well as perhaps traveling between villages for accommodations and even avoiding or beating the tour bus crowds. I suppose that would involve luggage transfer or do you rent panniers, as well? Any suggestions would be appreciated. hi jon, I’ll be in capadocia for 03 nights from 16 to 18 June. I want to do the bike ride on the 16th. I can do a full day’s ride. Hi Angela. OK- no problem. I’ll send you an email with the details! Thanks! I’m in Turkey for only a short trip from April 8-14 and was hoping to hit up Istanbul and Cappadocia. I’m a novice MTB but have a fairly high level of fitness and thought a day or even 1/2 day of MTB with you guys in Cappadocia would be stellar. Is it warm enough around that time of year? Would you have trails for keen novices? I look forward to hearing from you with suggestions and comments. Early April should be fine for biking in Cappadocia- a bit chilly still in the evenings but generally sunny! It would be a pleasure to show you around! We normally only offer day tours for groups of two or more but if you are a solo traveller we may be able to accommodate you. What date were you thinking about coming to Cappadocia? Hi, We are heading to Cappadocia this October and want to do some mountain biking. We are fairly fit and do lots of single track and downhill at home in BC. Do you rent all the gear? (pads/helmets/bikes?) Are there trail maps for that region?? Hello, we’re thinking of coming to Turkey in November and would like to do some road cycling, perhaps Cappadocia but we’re not sure about the weather- can you please advise? thank you. Hi Barbara. To be quite honest November in Cappadocia can be really bad weather and I wouldn’t advise a cycling holiday there any later than, say, October 20th. A more sensible area to go would be the Aegean Coast, which often is very pleasant right through the winter. However, if serious rains do come, they sometimes come in November- so there would be the chance of bad weather there too. Sorry to not be more helpful but October would be better! Hi, I am going to Bodrum in a couple of weeks and would like to go mountainbiking. I was wandering if there are any downhill trails near which are of interest? I would like to hire everything, bike pads, helmet and would like like to know if there are any companies near who could help. Hi Allan. I’m afraid that around Bodrum there isn’t really any proper MTB infrastructure at all, let alone a trail centre with lifts, gear etc… We will be putting together a MTB tour of the Aegean region soon, but to be honest Turkey’s first single centre downhill specific MTB holiday is most likely to be on Erciyes volcano, in Cappadocia, in central Turkey. Sorry not to be of more help and have a great holiday! Thats a shame, thanks for the info anyway. I will just have to enjoy the sun by the pool. I will try and book one of your tours at a later date. Thanks again. Hi Diane. Yes, Middle Earth Travel, based in the centre of Goreme, will be able to help you with a great half day guided tour in the local area. You can email them at info@middleearthtravel.com. It’s also possible that I may be there myself too and could guide you personally. Do you have MTB experience and what level of fitness would you say you were at? All the best, Jon. I am interested in a half day biking experience for 2 adults and 2 children aged 11 and 9.5. Could you let me know what the possibilities might be? We are going to be in Cappadocia April 20-21. This website is owned by Middle Earth Travel, working under the license of TURSAB 3242.